Oral Surgery is a branch of dentistry focusing on invasive procedures like complicated tooth extractions, elimination of infections within the soft tissues and bone and management of traumatic injuries to the head. Traumatic injuries can be injuries to the teeth and the facial bones. Trauma to the head is a serious medical condition and is outside the scope of oral surgery. Such cases are referred to hospitals, not the oral surgery clinics. Oral surgery is also known as oral and maxillofacial surgery. Oral surgery clinics are mostly situated in major hospitals as road traffic accident victims or cancer patients are frequently referred to the oral surgery department. Oral surgery patients can be an emergency case or even treated on an appointment basis. Patients with problematic wisdom tooth due to impaction which can result in decay (caries). Patients with swelling on their face. This is due to an infection in the soft tissue. Patients who want dental implants fitted in. Unsuccessful conventional root canal treatment. A procedure known as retrograde filling is done if symptoms persist after initial treatment. Patients who have been diagnosed with oral cancer. Post surgery treatment would include radiotherapy. Patients who have jaw fractures due to trauma. Patients who have difficulty opening and closing their jaws. Problems of the temporomandibular joint ( jaw joint ) are such as trismus and myofascial pain dysfunction. Patients who need to remove bony projections from the jaw prior to construction of dentures. These bony projections are known as tori. 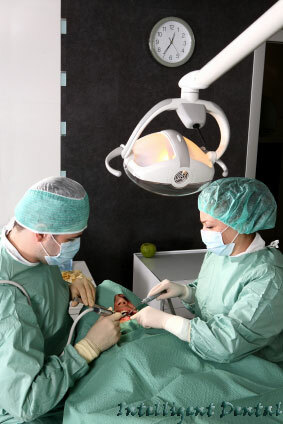 Oral Surgery procedures are done in completely sterile environments. Oral surgery instruments are sterilized prior to each treatment. Oral surgery anesthesia include local anesthesia or even general anesthesia. Certain medical conditions would contraindicate the usage of local anesthesia or general anesthesia. Depending on the case, patients are treated as in-patients or out-patients. 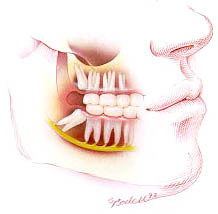 Oral surgery tooth impaction cases are common and this procedure is relatively easy. This oral surgery procedure does not require the patient to remain in the oral surgery clinic for a long period of time. Wisdom tooth impaction. Picture taken from Fatima Dental Hospital. Gingivectomy is done for patients with gum disease. An incision is made along the gums and a part is removed to allow for healing to take place on its own. Jaw resections ( partial or total removal of the jaw ) are carried out when patient has malignancy in the upper or lower jaw. In moderate cases, an area of the bone is removed. In severe cases, the entire jaw is removed. This oral surgery procedure is termed maxillectomy or mandibulotomy. Here is an oral surgery video of a resection of a large mandibular tumour. With oral surgery, the consequences of an oral surgery infection can be irradicated. Oral surgery wisdom tooth extractions are advocated because most people face problems with their wisdom tooth at one point or another. If swellings are allowed to remain in the facial tissues whether painful or not, the end result is extremely dangerous. Swellings can spread in the facial spaces (areas between the folds of the soft tissues) and occlude the airway. The infection can even spread upwards and cost brain infections. In cases of oral cancer, oral surgery can prevent the development of the disease. Oral cancer surgery is a multisectoral approach and will be dealt with in another article. Reconstruction is an oral surgery procedure which aims to restore the anatomy of the oral cavity and its surrounding structures. Hence, procedures as we have mentioned above like jaw resections will be restored back to its original shape and form. In the healthy individual, oral surgery procedures are deemed to be low risk procedures. Basic pre-operative instructions should be followed such as fasting for a few hours before the actual procedure so that the oral surgery anesthesia can work. Patients should abide by the post oral surgery instructions. Patients are advised to cease smoking after oral surgery as this would allow the tissue to heal. This has been proven scientifically. Smoking would result in poor healing of the oral tissues and possibly result in re-infection. Oral surgery can be costly therefore it is wise to check with your insurance companies or even employer to what extent dental oral surgery treatments are covered. Orthognathic Surgery: What Is It? This entry was posted in Oral Surgery and tagged oral cancer surgery, Oral Surgery, oral surgery anesthesia, oral surgery clinics, oral surgery infection, oral surgery procedures, oral surgery tooth extraction, oral surgery videos, oral surgery wisdom teeth, smoking after oral surgery on July 20, 2009 by jayelleenelial.